Kathy Sanchez, an Indigenous American potter from the historic San Ildefonso Pueblo, spent a week on the University of Wisconsin-Stout campus Sept. 16-20 during which she demonstrated her 1500-year-old craft. Sponsored by a grant from the Stout University Foundation Inc., Sanchez was the guest of the department of art and design. Sanchez carries on the tradition of her late great- grandmother, Maria Martinez, a world-famous potter. 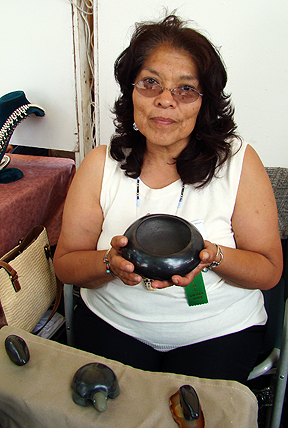 Known as blackware, her pottery is carried on through the extended family of San Ildefonso Pueblo potters. This traditional ware is now sought after and prized throughout the world. Though often termed “primitive,” the process she uses is really quite complex. The reddish earthenware pots are shaped by hand and, when dry, are coated with an earthenware slip. Before this “veneer” can completely dry, the surface is then polished with a smooth river stone. The stones themselves are prized tools, often passed down through generations of potters. After polishing, the pot is decorated with images and symbols of the Pueblo’s beliefs and heritage. Traditionally, a yucca plant “brush” with a chewed tip is used to decorate the earthenware. After drying, the pottery is placed on an open grate over cedar kindling and the pieces covered with thin metal such as flattened tin cans, old sheet metal and even surplus army food trays. Around this mound, either slab wood or dried dung cakes are stacked and, after all is ready, the kindling is ignited and the entire mound begins to burn. When the potter determines that the firing has progressed far enough, the flaming mound is quickly smothered with pulverized cow or horse manure. Then the “kiln” is covered with ashes from previous firings and allowed to smoke or carbonize for 45 minutes to an hour. When the pots are removed, the reddish polished areas have turned into a rich shiny black and the decorated areas a mat black, clearly in contrast to the surface of the pot. The effect is totally unlike any other unglazed pottery one might see. As Pueblo potters have gained more economic independence, their work continues to mature and develop. Sanchez has received numerous awards, such as the Smithsonian Native American Scholar Fellowship to research archival museum artifacts and a National Endowment for the Arts grant to produce a video, titled “Pi’ee Quiyo Spirit Woman of Clay,” chronicling six generations of Martinez blackware traditional pottery. She has been instrumental in helping to establish the Tewa Women United, a group comprised of women from eight pueblos in the Santa Fe area and dedicated to focusing “...self-esteem building, values clarification, communication skills, assertiveness training, adjustment to life transitions, alcohol education, issues of co- dependency and goal setting.” Her most recent involvement in this issue was her attendance at the International Womens’ Conference held last year in Beijing.